Date: 30th – 31st March, 2017. 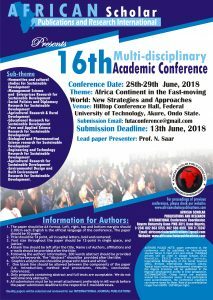 Venue: Kano State University of Science and Technology, Wudil, Kano State, Nigeria. Faculty of General Studies, Federal University Dutse, Jigawa State. This work is a functional Analysis of Nigerian English. The internets, library research, the researcher’s knowledge of the language and vast experience on English usage were used as sources of data. The aim of this study is to discuss the place of Nigerian English as distinct from other varieties of English such as South African English, Indian English, Ghanaian English, Kenyan English etc. The findings reveal linguistic features (phonological,morphological,lexical,semantic and syntactic)that indicate that English language has emerged and been made adoptive to some linguistic and cultural peculiarities in Nigeria. In other words, English language having left its ancestral home has resulted to different varieties in order to accommodate the culture and traditions of its adopted homes. The conclusion is that Nigerian English attempts to make the European language(British English) bear the weight of African imagination, worldview and sensibilities. Keywords: Nigerian English, Pidgin English, Broken English, Linguistic features, lexicon. Long Term Evolution (LTE)-Advanced Heterogeneous Networks (HetNets) deployment was introduced to address the increasing demand for Quality of Service (QoS), high data rates, and coverage extension. However, load balancing still remains a critical problem in HetNets. Adopting the conventional Reference Signal Receive Power (RSRP)-based cell selection in HetNets causes most user equipment (UE) to connect with the Macro eNodeBs (MeNBs) due to their higher transmit power as against that of the Pico eNodeBs (PeNBs), thus leading to serious load imbalance in HetNets. Therefore, this hybrid algorithm combined the channel gain-aware and the access-aware cell association metrics as a single metric for UE to base station association in LTE-Advanced HetNets deployment scenarios. The scenarios considered are the HetNets configuration 1 with uniform user distribution, which comprises of 4 PeNBs and 25 uniformly distributed UEs and configuration 4b of hotspot distribution, which comprises of 4 PeNBs and 30 UEs, two-third of which are clustered around the the PeNBs as defined by the 3rd Generation Partnership Project (3GPP) standard. The developed Hybrid Channel Gain Access Aware (HCGAA) scheme improved load balancing performance by 25.4% and 12.1%, respectively compared with the 3GPP RSRP and RSRP +CRE cell selection. Also, an enhanced pico connection ratio of up to 1.40 times and 1.21 times that of the RSRP and RSRP +CRE cell selection schemes was achieved by the HCGAA algorithm. These improvements translate to the efficient utilization of the network resource and prevent crowding of certain cells in the network. 1, Department of Office Technology and Management, Yaba College of Technology, Yaba, Lagos, Nigeria 2, Entrepreneurship Development Centre, Federal Polytechnic, Bauchi. The ultimate goal of business education is to enable the students have knowledge for and about business which will prepare them for life after graduation. Therefore, this paper sets out to highlight the various career paths/opportunities embedded in business education for youth empowerment and sustainability. The paper however, recommends the provision of certain resources which include well equipped career information centres, more financial aids from government and private individuals, ICT Laboratories for schools to enable them produce skilled and practically-oriented graduates who will be employable globally or empowered to face the current economic challenges of the country. *Department of Social Sciences, Kaduna Polytechnic,kaduna **Department Of Political Sciences, Kogi State University, Ayingba, Kogi State. The 21st century Nigeria is dominated by new threats of insecurity such as organized crime, trafficking and civil unrest which have continued to occupy centre stage in the nation and hinders sustainable business and technological transformation. Using secondary method of data collection and analysis, the paper therefore distilled that, the idea of strengthening legitimate institutions and governance to provide citizen security, justice and jobs is a critical issue that requires solemn commitment by any responsive government irrespective of the system or regime in operation. This is because there is a strong correlation between security, business and technological development. This paper recommends the need for restoring confidence, transforming institutions, providing specialized assistance, acting regionally to reduce external/internal stresses on the current fragile state of the nation as a road-map to sustainable business and technological transformation of Nigeria.